There was a flannel shirt there that was in perfect cream, green and rust autumn colors. So I made a flannel-covered plaid pumpkin. It was pretty darn easy and was absolutely cheap to do. 1. Gather your materials. I used floral pins, but you could use regular straight pins or beaded floral pins too. Grab some twine or rope to cover the stem, and cut the fabric into three strips. I’m not going to give you measurements… just eyeball it. 2. I needed 3 pieces to cover the pumpkin. Make sure they are long enough to cover the bottom of your pumpkin and then some. You can always trim it up later. 3. Sort of pleat the fabric around the stem of the pumpkin. You should be able to push the pin right through the pumpkin. 4. Take the next piece of fabric and slightly fold over the edge so that you have a finished looking edge. Secure it on the next third of the pumpkin, making sure it overlaps the first piece of fabric just a little. 5. Kindly ignore the messy nail polish and the fact that I’m way over-due for a manicure. Fire up your glue gun. 6. 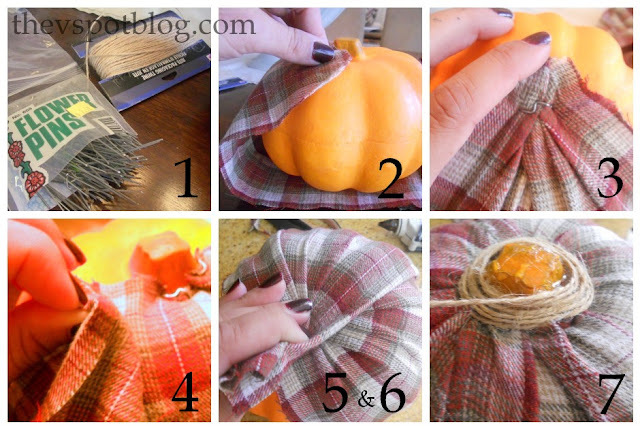 Play with the fabric a little, pulling it down to the bottom of the pumpkin and make little pleats there. You want the fabric to be pulled tight down the sides, and not loose or puffy anywhere. When you figure out where you want it, go ahead and glue into place. Trim fabric after each section is glued down. 7. Carefully glue your twine in a circular fashion, so that the floral pins are covered and the stem is covered. That’s it. Cheap and easy. My boxes of fall decor are still in the garage. This will get a permanent place once I unpack everything else. For now, it’s just going to hang out here alone. Guess what? My Mod Podged Chair is being featured today over at Roadkill Rescue! Please go check it out! Cute, Vivian! You could make quite a basketful with just the one shirt :). That is super cute! I may cover my Halloween pumpkins in fall fabric and undress them for Halloween…but that may be too much work this lazy lady! Thanks for the shout-out, I’m linking you up! I could totally do that!! That’s wonderful. I have a pumpkin collection (I just realized how cheesy that sounds) that started 26 years ago. After all these years, I don’t think I’ve ever made my own pumpkin. You’ve inspired me! Cute! Think I will try this. It turned out soooo cute!! I love that plaid lil pumpkin! My favorite part is how you wrapped the top so nice and neat! Where will you place it? And I need to see your fall fireplace decorations! Love this Viv!! It’s so sweet!! The plaid is perfect! Love, love, LOVE! So cute! I’m headed to the thrift store tomorrow – I’ll keep my eyes open for a fun flannel shirt that is just asking to be re-purposed! Can I use any of my husband’s flannel shirts or just the ones he no longer wears? I love this, like SUPER LOVE it! My favorite part is the stem. So cute. They’d be darling in a big basket or bowl. I love anything plaid/tartan. Hopping over from Savvy Southern Style. I love your flannel covered pumpkin! The project I linked up was a Dollar Store pumpkin that I transformed too! I pinned this!!! This is a fabulous idea…thanks! I have to do this. Yes! This is so darn cute! I have a dough bowl, and some of these would look great in it. Thanks for sharing the idea! Love it Viv! Cool idea! I want you to know that I am a strange and bizarre person. I have even been called a member of the lunatic fringe; but I would have NEVER thought of making a plaid flannel pumpkin! Yet I rather like it! You are so creative! I love that cute little pumpkin. I can’t wait to go Goodwill hunting for some fall decorations. Wow!! I just saw a large pumpkin downtown in a interior decor shop for 60 bucks similar to this one…I LOVE this idea much better!! I’m gonna go check out the shirt aisle in the thrift store!! Thanks for the simple to understand tutorial!! Great way to recycle old clothes! I think I’m going to have to copy you! Stop on over, I have a linky party going on as well as a giveaway! Oh holy cow that is Adorable!!!! What a cute, cute idea!!!!! Seriously, your brain is awesome!!! I’m so happy you share stuff cuz I’d never think of this in a million years!!!! And. Are you saying you might pee on the Goodwill? sweet pumpkin:) love plaid too! How cute and what a great way to use up old shirts or even sweaters I’m thinkin’!! I always have loved plaid and it is so popular this year too. Your pumpkin looks great. Cute plaid pumpkin. thanks for sharing at Wow. What a great idea! Thanks for the inspiration! I must say, it looks better with the plaid on it than it did fresh from the dollar-store. What a cute idea! Flannel definitely = fall. Now I want to do a project with flannel. Thanks for the inspiration (and adding to my already long to do list!). Great inspiration, Vivienne! I love how you covered the stem! I am officially in love with this. 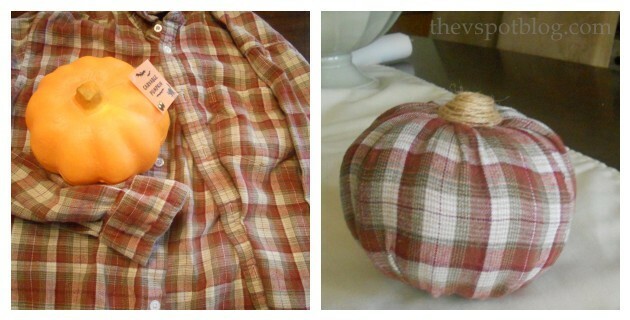 I can’t sew, so I am always looking for ways I can make fabric pumpkins. I hope you’ll stop by some time. Ack! How cute is that?! Visiting from tatertots & your link jumped right out at me! I love plaid ~ these look great! What a cute idea! 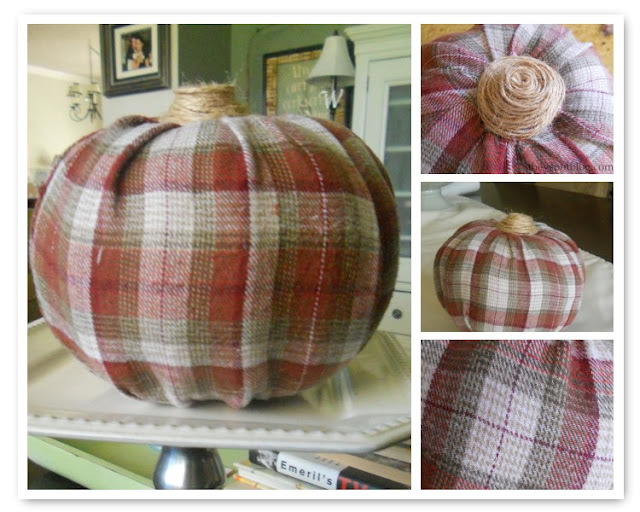 It was look awesome on a mantel full of different plaid pumpkins! That plaid flannel is perfect for fall! It just feels cozy. Good job! LOVE this, how cozy and warm! Would love to have you stop over for a visit sometime…. So country chic, love your pumpkin. Why would I never think that you could stick pins into those (fugly) foam-y pumpkins?? Genius. This combines two things I love: fast and flannel….I’m so making one! Baaaaa! This is so cute! I love it, pumpkin looks so cozy! These are cute! I love plaid! This is so cute! You did a beautiful job…thanks for the tutorial. Country Living just did a spread on covering pumpkins with fabric and i thought about trying it…now you’ve got me inspired! Viv, your project is awesome and had the most clicks at “A Little Birdie Told Me…” this week! Can’t wait to feature it! Such a cute idea! Plaid screams fall, too. My husband has some extra shirts that no longer fit him. I’ll have to make up some pumpkins! This is so cute and so easy, I’ll have to do it. What a fun way to bring fall colors into the house – I’ve already got enough orange outside! Lovely! I want to try it, too. I see a Dollar Store and Good Will in my future! Ummm… love. Pin, stumble, fb. I so have to laugh at all the different pumpkins I have now seen across blogland. From pearls and ribbons to string to now flannel. Good job. Very cute. This is such a fun idea! I would love to feature this on Reduce, Reuse, Upcycle. Feel free to stop by and grab a featured button. Thanks! So cute! I’d love for you to link up to my new linky party – Creative Genius @ http://www.thecreativepaige.com!